From a strictly formal point of view, if half plus one of the citizens do not vote then democracy is really absurd. “The will of the people” can not be a minority regarding the total number of citizens. As we have seen before, the very concept of “people” itself contains certain contradictions and absurdities specific to social tradition and its slave systems crimes. But, if the number of voters is not at least half of the citizens, then the absurdity of democracy made with minority people, compared to the real number of citizens, acts as a mirror for the absurdity of the system itself. If the number of votes is smaller than of those who do not vote, then the feeble concept of “democracy” loses coherence for good. Such a democracy resembles very much with the dictatorships that loudly hates. Therefore the main interest of contemporary social system is to hide, to camouflage as effectively as possible this situation. The problem is that the contemporary slave (called worker or manager, recently) loses its enthusiasm if find out that the society is based on this type of inequity and the “American Dream” is a long line of disappointments. Maintaining the illusions and creating new others, is part of electoral institution in democracy. The electoral institution is the system’s response to the contemporary slave life. Just like a circus magic number, the social system prospers by offering illusions to the slave, thus making her or him willingly serve the masters. This is the main difference between death threatening classical slavery and the illusions luring modern slavery. The slave lives through illusions, she or he agrees to give up her or his freedom and work in the factory or in a certain company in exchange for promises of rising up on the social hierarchy. After a while, she or he notices that not only there was no climbing on this ladder, but sometimes there was even stepping down and sacrifices on behalf of those promises. The political system is designed to reillusionate this disappointment. For this failure the salve blames the elected politician and her or his naive optimism turns into the image of the new politician. The new politician seduces as the old politician disgusts. Just like judo method that takes the opponent power, the system has learned to take the contemporary slave’s hard desire to change its life for even more enslavement. The consumerist slavery emergence was primarily due to the serious social revolts that took place in civilized Western society in the last two centuries. The ancient masters knew how to adapt to this new situation, turning to a new social mechanism by setting the slave free before it loses its mind with anger and take revenge on them. The discharge systems do just that. When a workman loses its enthusiasm that was initially lured to work in a factory or company in a stressful job, then the manager prefers to let it go rather than risk a strike. Subsequently, the system is arming by recruiting mercenaries, ready to kill the rebels who would start such a revolt against the living conditions they have. Any protests could be smothered in blood today, unlike the past centuries. However, such a measure is not very profitable on the long term for the master; it can work on the short term, it can quell the revolt but, on the long term, such actions attract popular antipathy and refusal to accept the job that the master proposes. Therefore there are tempering social mechanisms needed for this slave’s natural tendency to rebel. Some of them focus on the micro-social space and others in the macro-social one. The micro-social mechanisms for tempering the slave rebellion are the discharging and the Union systems. At the macro- social level there are used the political bluff, the voting system. As real strategists, and as successors of the ancient robbers, the new robbers control the current social system dynamics and invest into this ideological patchwork crime of contemporary slavery alluring, but supported by the oppressive forces, as the classical slavery also. As the consumerist slavery is beautifully embellished in freedom of choice, the same way the promised political freedom is embellished by so-called right to vote and to be elected to higher decision-making social bodies of the political system. But the exceptions of those who, at one particular time, manage to break into the decision-making structures, are insignificant. Those who do not respond to lobbyists’ pressure, or do not accept perversions of their intentions in the slavery way, are sooner or later removed from the system. But the real vote was never available for all. In the past, only the privileged ones used to vote. Although it is called democracy and was even the first form of democracy in history, the Athenian political system by the time of Pericles, was a bit larger than so-called oligarchy; those who had the right to vote were a minority compared to the total number of inhabitants of Athens. In the contemporary democracy, the citizens’ vote is pretty meaningless because they actually only choose a “representative” person to whom would be giving up their genuine right to choose. That means: “I agree to vote that I can not decide anything directly” or “I vote that I agree to give up my political rights to X”. Most of the citizens may be naïve indeed, but from a certain age they start figuring up that the political vote in democracy is bluffing, just like in the dictatorship. If in dictatorship “it doesn’t matter who votes, it matters who counts the votes”, in democracy “it doesn’t matter who comes president but who lobbies the president to do something”. No matter if one votes a president who fought among the first against the Iraq war. No matter if one is seduced by the idea that the next moment after being installed president in the office (who held anti-war ideas even before they were supported by citizens) the war would end. The reality was different. The war engineers made lobby so that the war continued for more three years under various pretexts, after Bush finished his mandate. Many Americans were convinced that Obama will end the war, according to his criticism against it ever since it had not even started. The president is put there for that kind of lying promising, and this is the meaning of any politician in democracy. If that politician managed to convince and persuade citizens of being a part of their world, then the occult forces of the system can quietly see their shady business. This hard need that authorities to bring citizens to (false) vote at all costs (there are many voices that support the idea of obligatory voting) have, however, a more terrifying foundation than the slave’s superficial illusions speculation and attracting into the newslavery gearing. This is the war itself. These statements has a certain tautological connotation; if our half civilized society provides citizen rights and, in a certain extent, disavow the abuses against people, however in the past they were considered normal. Before the elegant manners society there was the barbarous robbery society. The culture warrior mentality survival into the high manners society is part of the contemporary human psychopathology structure. As the war was the primary source for slaves, we can imagine that the modern new slavery uses the war whenever it can. The war, as death threat, scares the slave to become more productive and the successors of those threatened until a few centuries ago will feel the anguish of such threat and will try to give everything in work to save their lives in the symbolic mind level. Therefore, the so grotesque value of war is the very blood of democracy. Under the pretext of trying to make peace, the democracy maintains and develops wars with ease in different parts of the world. I remember a line from a movie when a citizen complained about Germany’ decay in front of a Nazi soldier. Nazi replied: “people decided that”. I am convinced that such a response was actually used in real life. This is in fact the very purpose of voting in a democracy: when workers strike against working conditions, one can justify the force intervention against them exactly with this reply: ‘X ordered us to kick or to shoot you and X was elected by the people, so the people decided that’. Here’s how the electoral phenomenon manages to transform a crime, like a robbery or an armed intervention against the worker, in a justifiable fact. The money invested in election campaign, posters, leaflets, food and beer, show, circus etc. is later recovered when the dupes will also pay the bill by enduring the difficult working conditions that will cheerfully enrich their masters. And if there would be a strike then ‘the security’ is prepared for them to make order after the principle ‘you wanted it’. That is why this grotesque election show is needed. That is why this bluff to vote is needed. 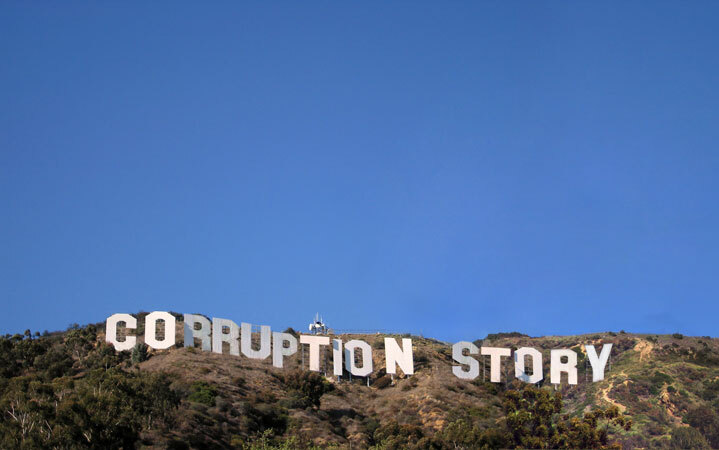 Using Hollywood stars to convince undecided or naive people to vote and support this bluff is one of those attempts to repair the system’ image. The strange situation of contemporary democracy is that that it is supported mainly by naive and poorly educated people concerning public issues, people without life experience and without knowledge about history. Such a naive youth voting mobilisation video is not meant to make poeple responsible for the political system or to teach the least about society but only to deceive them first, overvaluating their political power to the expense of skeptics, in order to be perverted by vested interests. But normally things should be exactly the opposite, namely those inexperienced or untrained in a field, should have less power to decide. And those involved and trained enough to political issues should be somehow accepted as part of the system but not threatened by the police to reduce their voice. It is only after 5-10 years when the naive citizens, first convinced by their generation idols to go and support the political system, start to realize the way things go in politics, understand the system’s perversity and become skeptical in supporting it. Unfortunately, just when they become a bit more lucid concerning society, the political system gets rid of and tries to hide their political power under new social frauds. The new generations of naive with their new idols are ready to cover the old disappointment with naive enthusiasm. This is the very sin of democracy, meaning the fact that it is more oligarchy than what it presents itself to be. The democracy does not respect the rules which itself requires for citizens unless it is forced to do it. This manic tendency to circumvent the laws and decay into dictatorial attitude persists even in the most stable and robust democracies in the world today. Paradoxically, maybe the slavery will help humanity to reach the overall civilization and such a development level that will facilitate the life proliferation into hostile places in the universe. Perhaps these ideological scams will make human being smarter, more technical and wiser in the future. In this case, the wars, the crimes and all the human suffering along the way will be forgotten. Just like an effort that involves some discomfort, but may end up with a remarkable fulfillment, the usage these false values can be such a historically extended stage. However, in this hypothetical case, these "values" will be abandoned by a humanity that is interested in the service of life, not in the service of suffering. These false values should be treated as they are, if not despised. Is total nonsense to have blindly faith in them, as corporate mentality does.